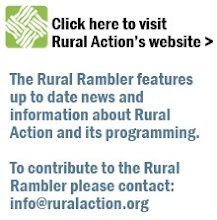 The Rural Rambler: This in From Rural Action Sustainable Forestry: SIGN UP NOW FOR CONSERVATION ASSISTANCE - Over $18 Million Available! This in From Rural Action Sustainable Forestry: SIGN UP NOW FOR CONSERVATION ASSISTANCE - Over $18 Million Available! Ohio agricultural producers and landowners interested in protecting or improving natural resources on their land are urged to contact their local USDA Natural Resources Conservation Service (NRCS) office before February 16 to take advantage of financial assistance in 2010. While most NRCS programs are offered through a continuous sign-up, NRCS typically makes funding selections once a year. Each program focuses on a different aspect of natural resources conservation, as is indicated in the name of the program. In addition to regular conservation programs, special funding pools are available for nonindustrial private forest owners and producers in counties with air quality issues. Interested agricultural producers and landowners are encouraged to contact their local USDA Service Center office or check the agency’s web site at www.oh.nrcs.usda.gov for more information.